Ladybridge High School win the North West Enterprise Challenge Regional Final! 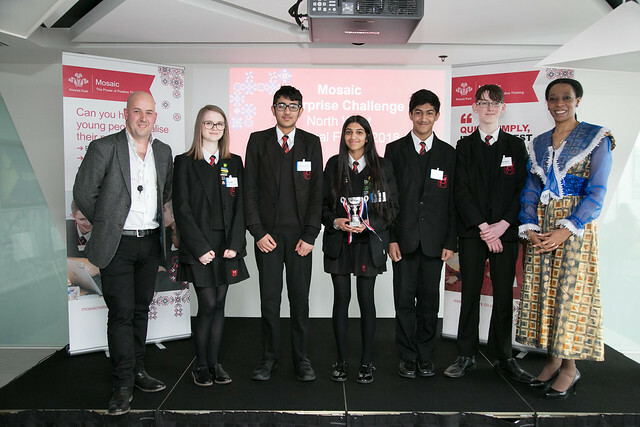 A young team of aspiring entrepreneurs from Ladybridge High School in Bolton have won the North West Regional Final of the 2018 Mosaic Enterprise Challenge competition, hosted at KPMG Manchester. Mosaic North West Regional Final Champions from Ladybridge High School with the judging panel and keynote speaker, Laurence Marlor! 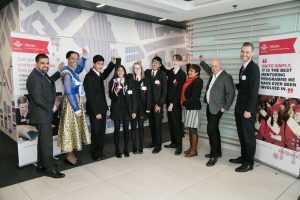 Having beaten others within their region and other finalist teams from North Chadderton School, Calderstones High School, Manchester Islamic High School for Girls and St Annes RC High School, Team Companion from Ladybridge High School beat off the competition with their idea for a new mental health app. All finalists taking part had worked hard to beat off 140 other teams of students from schools across the North West to reach the finals. Presenting their ideas in a Dragons’ Den style pitch, with the Manchester skyline in the background at the impressive KPMG Manchester office, all the teams wowed the panel of highly acclaimed judges including: Dr Erinma Bell MBE – Deputy Lieutenant for Greater Manchester, David Wood – Tax Senior Manager from KPMG, Siddika Ahmed – CEO of Breaking the Cycle and Irfan Munir, a Partner at MWG Solicitors. KPMG are hosting not one but two Enterprise Challenge regional finals in 2018. Team Companion will now enter the final stage of the competition and progress to the Enterprise Challenge Grand Finals in London on the 16th May, where they will go on to compete against all other winning schools from respective areas including the West Midlands, Yorkshire, Glasgow, the South West and London for the chance to become the national champions of 2018! Chair of judges, Dr Erinma Bell MBE was particularly impressed: “I was pleasantly surprised at how well the students covered highly relevant social issues, such as mental health, as well as issues which gravely effect young people in particular. Run annually, Mosaic’s Enterprise Challenge is a national competition that is part of The Prince’s Trust and which aims to inspire knowledge, raise aspirations, confidence, self-efficacy and long-term employability among secondary school pupils from some of the most deprived communities across the UK. Supported by specialist, volunteer mentors from across the business community, students compete for seven-weeks in an online business game where they must develop, market and sell a new product.